It is here: the new Hi-Viz Aqua-Ω. It will be better visible and you will have a choice of regular (red) handles, or slightly larger (blue) handles. Why two sizes handles? 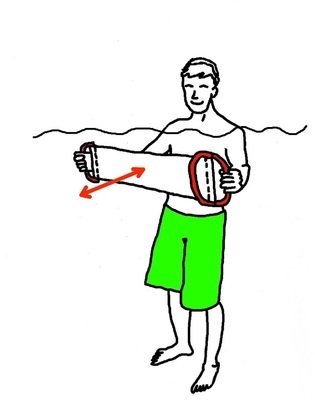 As a licensed physical therapist and certified water aerobics instructor for 20-plus years, I have been looking for and thinking about a piece of equipment, specifically designed for use in the water, to increase strength and endurance of the person using it while fully utilizing the properties and mechanics of water. Most equipment used in water exercise is either buoyant therefore eliminating some muscle functions or just land-based equipment brought into the aquatic environment. These pieces of equipment do not use the water to its full potential, and could even pose undue risks when used with the untrained, aging, or impaired population. There is some great drag resistance equipment available; however, often you will need a special set of equipment for arms and a different set for legs. I really wanted something that can be used for both arms and legs, that easily can be modified for size and resistance level and that can be used safely by all populations. The Aqua-Ω is all that and more. The new, affordable, and fun way to turn your time in the pool into an effective strength training or aerobic workout. Using only drag resistance through the water, it is a safe and simple piece of water exercise equipment. We call it the Aqua-Ω because the Greek symbol Ω is used as symbol for (electrical) resistance, and referred to as 'Ohm.' When you pull this equipment through the water, it even slightly resembles the shape of the Ω . All in all, the Aqua-Ω is easy and safe to use. You will not need special training to be able to use this by yourself or for your class. Just add water and have fun! The red lines on the Aqua-Ω used in this video are for visbility only. They do NOT occur on the Original Aqua-Ω.